Seller has reduced the price and is motivated to relocate, bring your offer! Picturesque, Mediterranean inspired four bedroom, five bath villa. This impeccable single-story is located in the exclusive community of Rolling Hills Estates. Offering over 6000 sq ft of luxurious indoor living space. The 2.82 acre equestrian property is perched high, offering panoramic mountain and valley views. The sparkling pool allows you to cool off while enjoying the surrounding landscape. Backyard features a covered outdoSeller has reduced the price and is motivated to relocate, bring your offer! Picturesque, Mediterranean inspired four bedroom, five bath villa. 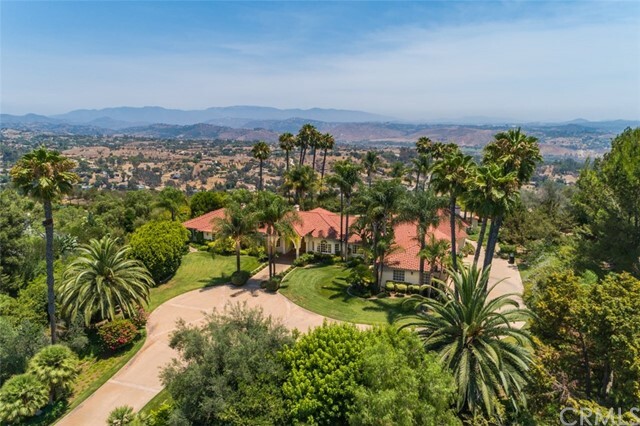 This impeccable single-story is located in the exclusive community of Rolling Hills Estates. Offering over 6000 sq ft of luxurious indoor living space. The 2.82 acre equestrian property is perched high, offering panoramic mountain and valley views. The sparkling pool allows you to cool off while enjoying the surrounding landscape. Backyard features a covered outdoor patio complete w grill, fridge and sink for entertaining. Over 75 avocado trees with a multitude of citrus, fig and stone fruit trees. The irrigation well keeps the yard lush. The pump was recently replaced. The chefs Kitchen features upscale built-in-appliances, grill and walk-in pantry. Custom marble and hardwood flooring with skylights throughout providing the home with abundant natural light. Master retreat has separate his and her closets and bathrooms. The multi-zoned HVAC has been recently replaced. This home and property have been meticulously cared for by the Original Owners. This is an equestrian property. The community of Rolling Hills offers riding trails, stables, riding arena and tennis courts. Over $50,000 in solar equipment/paid in full.